But Is The Show Over? 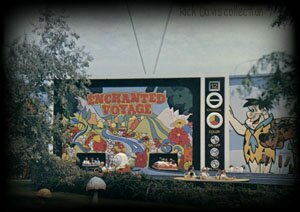 In 1972, when King's Island introduced the Enchanted Voyage, they were starting something. Something that like wine, has only improved with age. This ride, which featured all the Hanna Barbera Characters, welcomed many happy visitors for 10 years. Then in 1982, it morphed into The Smurfs Enchanted Voyage, where visitors could experience the seasons of the year as only seen in Smurfdom. 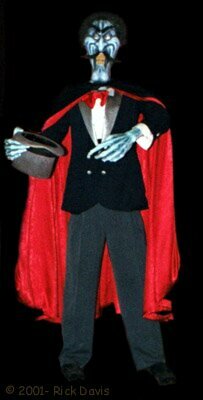 The ride saw yet a third transition in celebrating it's 20th Anniversary in 1992 as The Phantom Theater. The boat system was removed and replaced with a people-mover system created by Morgan Mfg. The Smurfs moved out and a ghastly, ghostly cast of characters moved in. 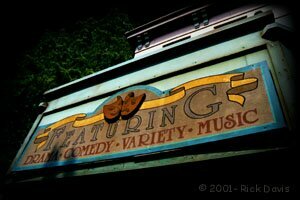 The theater, which is at the entrance to Hanna Barbera Land, is mild and family themed, yet it presents that nostalgic feeling of the old dark rides because one still doesn't know who or what's around any corner. 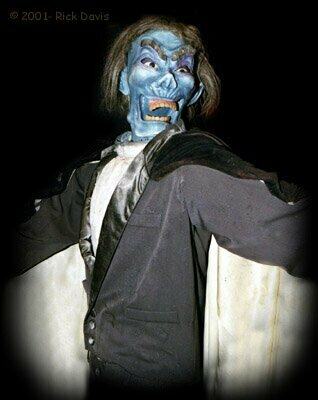 From 1992 to the present, the Phantom Maestro and his troupe of performers have thrilled people of all ages. 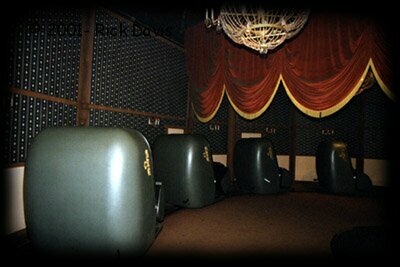 Perhaps some of us have even become dark ride fans after a first visit to the theater. 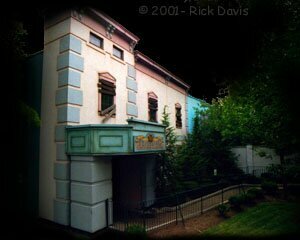 PKI's Marketing Communications Rep, Jeffrey Siebert, who was kind enough to give Rick Davis and me a quick behind the scenes tour, informed us that The Phantom Theater welcomed 914,000 visitors and ranked 6th among the top 10 rides (at PKI) during the 2000 season. That figure was double that of their Drop Zone! 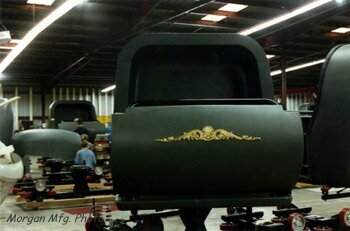 The animation was done by AVG, Inc. with the theme designed by R & R Animation, the same company who themed Adventure Express, a mini train coaster at PKI. 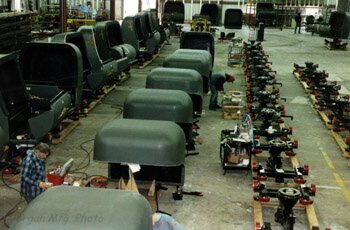 The people-mover system, a product of Morgan Manufacturing, consists of 55 cars, which seat 4 and travels along a five-minute plus course. This ride, my favorite at PKI, boasts 17 humorous scenes of robust color and imaginative variety, all centered on the onstage and behind-the-scenes workings of a theater. 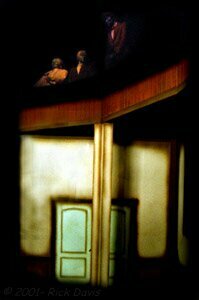 DAFE members can once again enjoy some of their "old Favorite" gags here, such as the Pepper's Ghost illusion used in the large, culminating scene, where all the actors are onstage together, while ghostly audience members look down from their box seats. 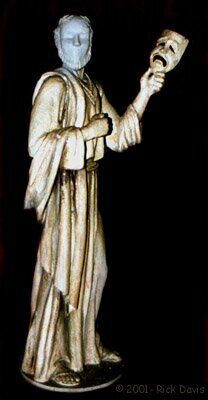 The figures appear before us as transparent phantoms, their images reflected on glass in front of us from the actual figures that are below and above us in this scene. 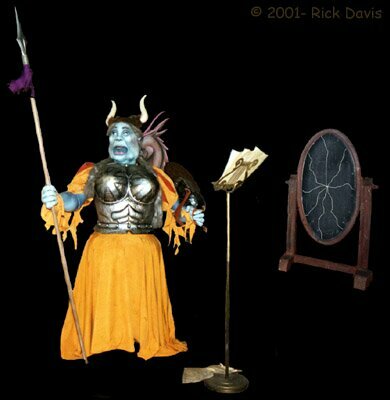 In two areas, projected "talking faces" are chatting away at us as we pass first a statue of a once famous Shakespearean actor, and later a Roman Centurion statue in the prop room. 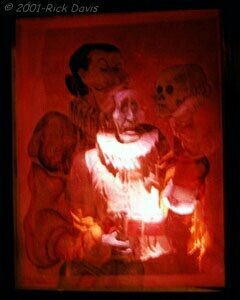 A huge fire is blazing in a haunted fireplace in the same prop room, via the old orange backlit blowing plastic trick. 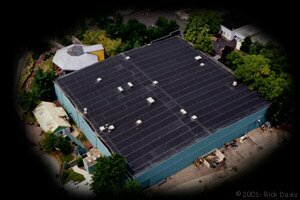 Mr. Seibert stated that during its 10 years of operation, the Theater has undergone no changes, other than those required for PKI's FearFest during the Halloween season last year. During the Fest, the ride became "The Museum Of Horrors". This was accomplished by putting more frightening faces on the animated characters in addition to interspersing 10 live actors throughout the ride. The FearFest ran during weekends in October. 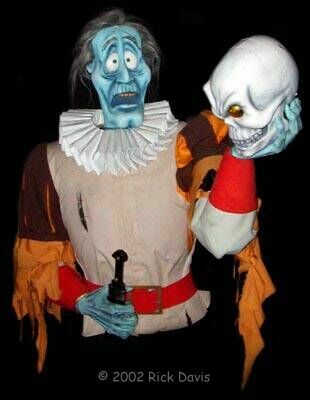 It has not been determined as of this writing whether the ride will be involved in FearFest again this year. The treatment of the outside of the building is far too simple, in my opinion. I would have a field day there with some spider webs, more broken/boarded windows, tattered shutters, and a rundown abandoned ticket booth perhaps. No effort was made to create a spooky facade, I assume to keep the ride's first impression in line with where it is geographically located. It is child/family oriented, after all. So, join us now as we enter the Phantom Theater. 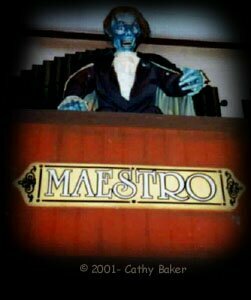 Pass through the long empty lobby, where our host, the Maestro, is playing his pipe organ in the loft overhead center. 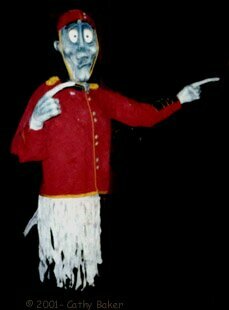 Don't be alarmed when he spins around to taunt you while you wait in lineLook closely at the posters of the performers; they looked quite differently when they were among the living. 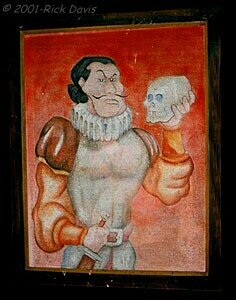 You will soon be meeting them as they are now: Houdelini, the magician; Lionel Burymore, the actor; Willard Warbler, singer; Hilda Bovine, Opera star of great girth; the Great Garbonzo, daredevil; and the Mighty Bosco.. 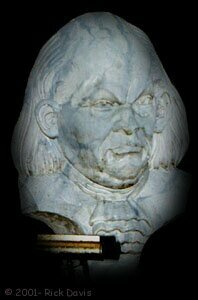 Enter into the upper candlelit hallway, where the concave molds (which are framed as pictures or busts) of the performers faces seem to follow your movement as you pass by. As soon as you enter the queue area, you are ushered into a moving ride car before it glides around the first darkened corner. Around the first turn, the Maestro awaits us, holding the curtain back and once again taunting his visitors, "So� You want to see the theater, do ya? Well, go ahead." He then turns his head to face you in passing and growls "What are YOU looking at?" 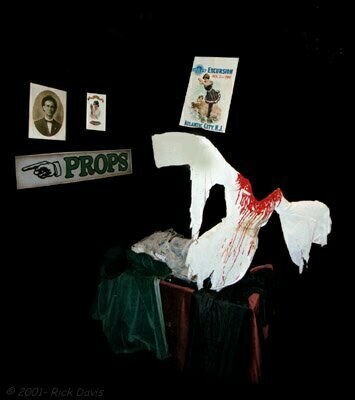 We enter the hall of portraits, a gallery of the performers, as they WERE when among the living. Using the backlit scrim effect, each portrait transforms into a 3D image of the performer in his current state as we pass by. 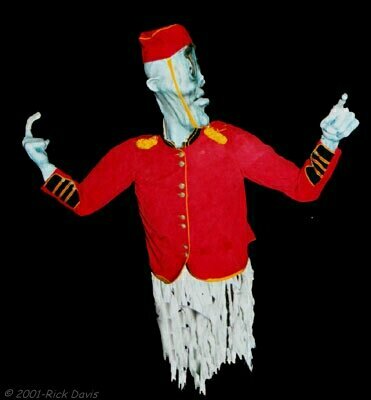 "Hurry along now...this way"...prompts a disembodied usher, appearing twice along the way. Soon we round the corner, where the light man at the board waves us on with his "Go on now, this theater is no place to play around!" 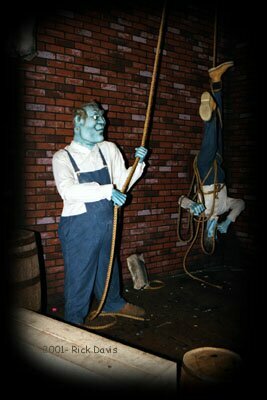 A clumsy stagehand is "wrapped" up in his work as he dangles by his feet, entangled in a rope. 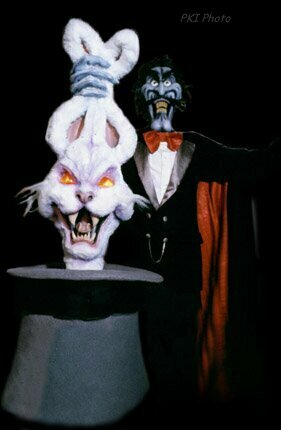 On stage we find Houdelini pulling an enraged rabbit from his hat as his baton and playing cards dance atop the table. 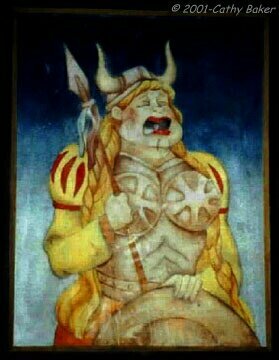 A soprano for sure, Hilda Bovine hits a high note as her mirror breaks. The usher again points the way for us. 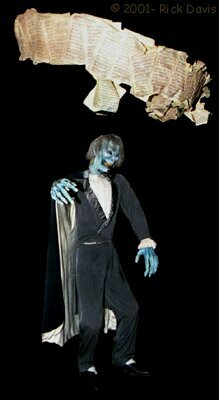 A trip to the stage with its cast of ghostly guests is next, courtesy of the "Pepper's Ghost" illusion. A bloody dress hovers above its trunk. "Come in, look around. We don't get many visitors down here. 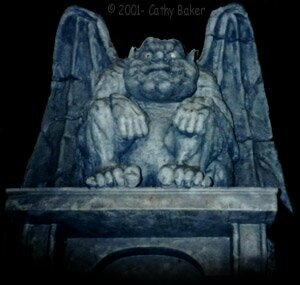 Don't be frightened; gargoyles are vegetarian!" 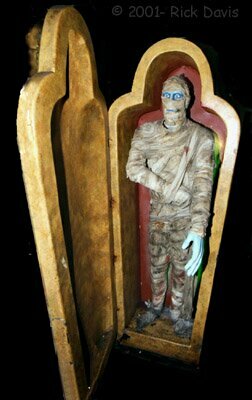 A mummy groans as he opens the lid to his sarcophagus as we pass by on our way to the prop room. 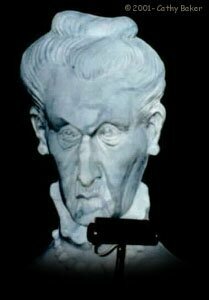 A Roman Centurion, with moving projected face, yells, "Halt! Who goes there! Stop and be identified by the Centurion! You have come too far! You have seen too much! So sayeth the Centurion." 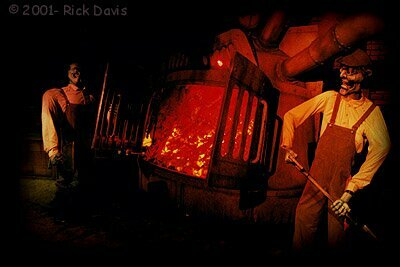 Just when we thought we were safely near the exit, we find we must first survive the taunts of the furnace men, and a hot cinder-scented blast as we pass before the giant furnace. Then we round the final corner, back into the queue area. "But you'll be back! You'll be back!" To be? Or not to be? That is the question. 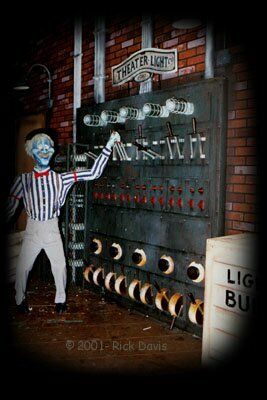 During our behind the scenes visit and on the phone, Mr. Siebert was not able to confirm any future plans for the demise of The Phantom Theater to make way for a transformation of the ride. BUT... he often referred pointedly to the fact that this ride has changed every 10 years since 1972. 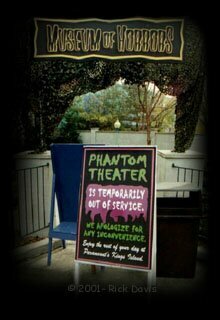 So, if History does in deed repeat itself, the Phantom Theater will be no more than a ghost of a memory after the 2001 season.